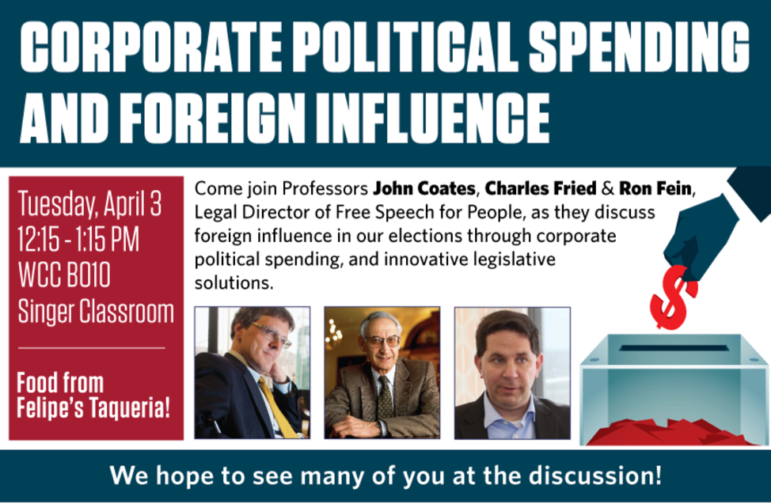 Free Speech For People Legal Director, Ron Fein, will join Harvard School of Law Professors John Coates and Charles Fried for the lunchtime forum event, Corporate Political Spending and Foreign Influence. The speakers will discuss foreign influence in elections, how Citizens United opens the door to foreign influence through corporate political spending, and innovative legislative solutions (starting with our groundbreaking legislation in St. Petersburg, FL) to address political spending by foreign-influenced corporations. The event is free and open to the public. Lunch will be served. Click here for directions to the campus, parking information, and a campus map of Harvard Law School.